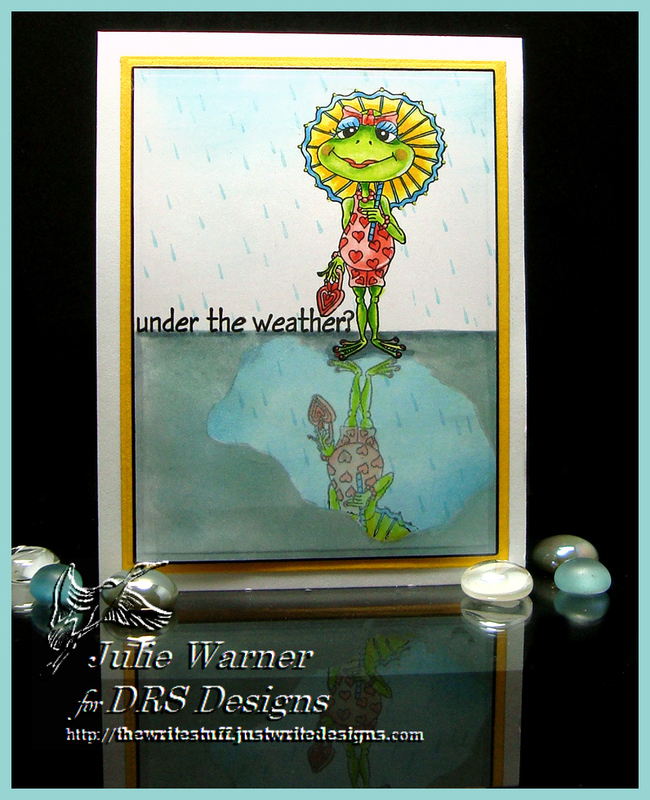 The Ways to Use It Challenge (WT572) today is to use humor on a card. To me this girly girl frog w/ all her makeup, umbrella & purse surely stand on the side of humorous. And I think my title says it all…the weather we’ve had here the last few days, only a frog could love. Torrential downpours, thunderstorms & howling winds. At least it stopped raining before we washed away..now we’re just gone with the wind, lol. 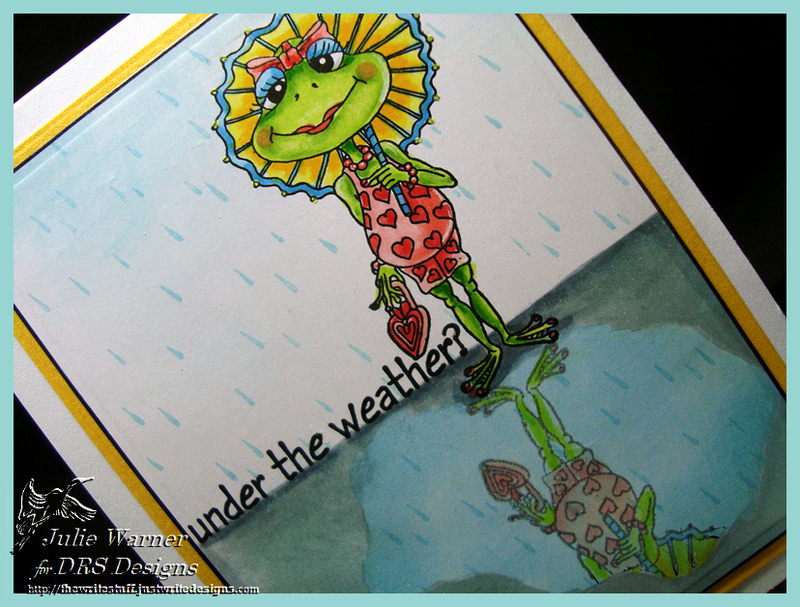 For my frog under the weather card, I did a little variation on the reflection technique. I’ve done this technique quite a few times, but this was the first time I used the Misti to help out & the first time I used an odd shaped area for the reflection. Lydia, the community manager at Splitcoast had a card & a link to her video for doing this & it started me thinking. So I gave it a try & I like it. I followed her directions except I had to use the back of a large stamp for the piece of rubber she used. 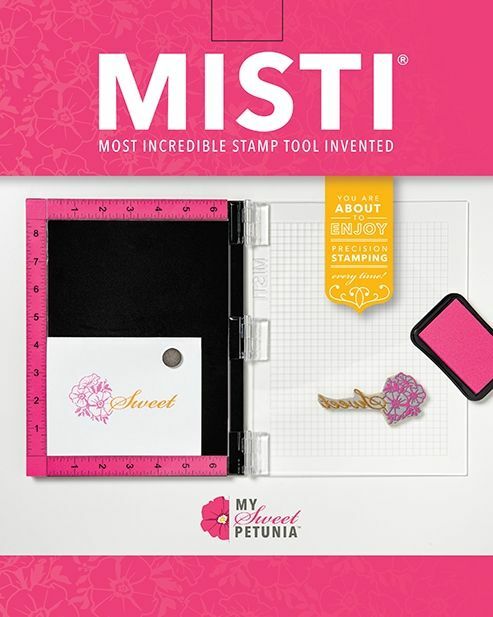 Having the image in the Misti & stamping it more than once onto the rubber really helped the process. Since the reflection is supposed to be lighter than the original, I used gray flannel ink for the reflection & black for the original & I used the lighter colors of Copics to color the reflection. But I’m getting ahead of myself. First of all, I used a pair of little scissors to cut the odd shaped puddle in the middle of a piece of copy paper…placed it over the white card stock, & sponged the tumbled glass ink inside the opening…not too evenly. Then I placed the piece I cut out on top of the blue puddle & sponged some of the weathered wood & tumbled glass around for the ground. I made sure to have a straight edge for the horizon. Then I put the original mask w/ cut out puddle back on & did the reflection part. Removed the mask, positioned the original Frog Sunbather image & stamped it above the reflection. 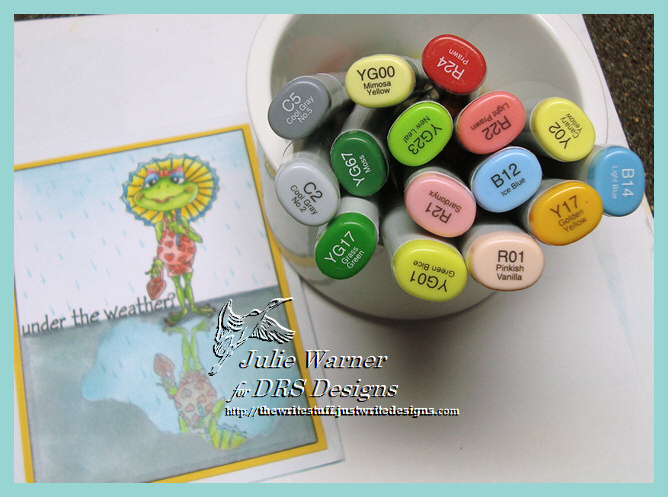 Colored it all then stamped some raindrops after masking the original image and the ground around the puddle. I only used part of the greeting (I put the full greeting on the inside) & I used a Micron pen to add the question mark at the end. Thanks so much for stopping by! And thanks, Lydia , for the wonderful video & idea! 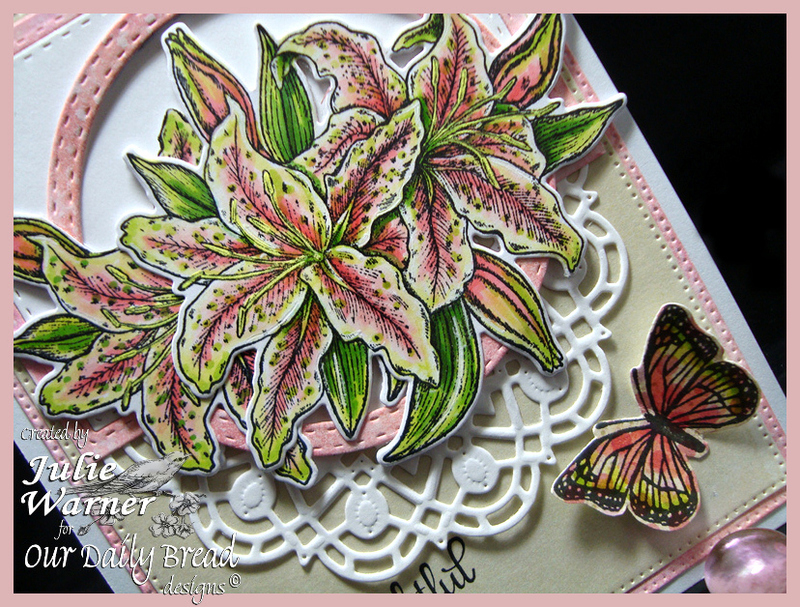 A big congrats to Jenny, the newest Featured Stamper (FS472) on Splitcoast! She has a wonderful garden of a gallery, with lots of flowery creations. I chose THIS to case. I kept the flowers, butterfly & doily, but moved the greeting & put it on the front panel & used different images & slightly different colors. 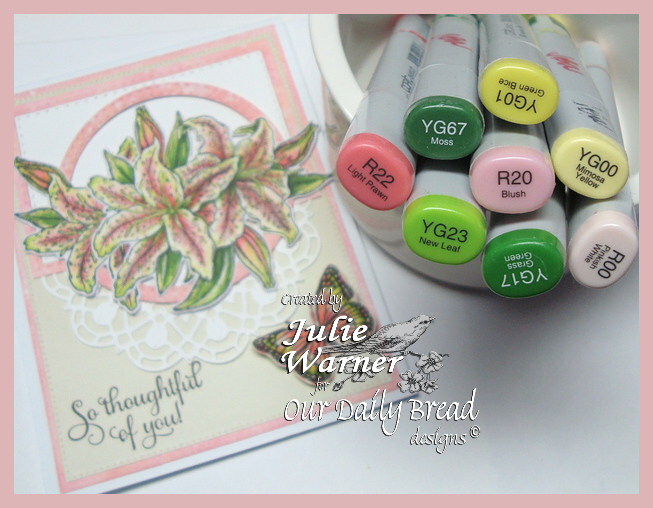 For my flowery card, I put the lily image in my Misti, stamped it w/ Memento, colored w/ Copics, then over stamped w/ Versafine. 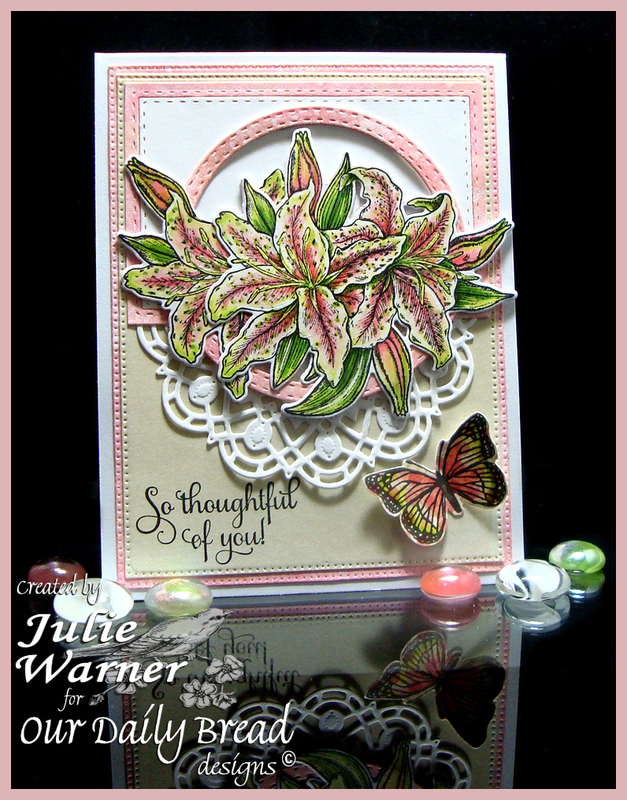 I repeated this for another lily then die cut both w/ the new matching Lily die. I didn’t have the exact peachy color I wanted for one of the layers, so I sponged it w/ a combo of the Distress inks then spritzed w/ my self made acrylic white paint & water spray (about 3 to 1, water to paint mix) to soften it a little. When it dried, I die cut the the 2 layers & the stitched ring behind the lilies. 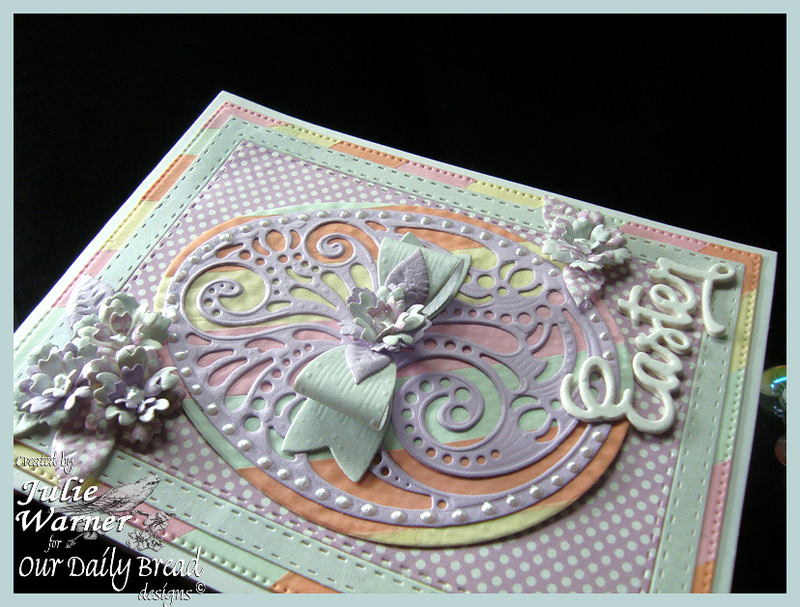 I added a butterfly & a partial doily die cut to finish. Congrats again, Jenny! Thanks so much for stopping by! ODBD February Release Look Back! Today we are taking a look back at the Our Daily Bread designs February Release! 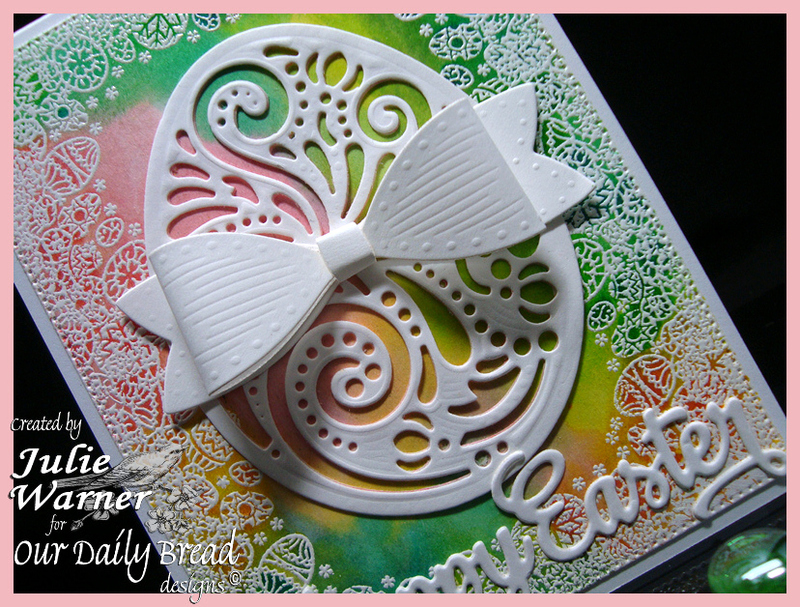 I’m featuring the big, beautiful Boho Egg dies in both of my cards. The idea for this card came last week when a Splitcoast challenge wanted us to use Washi tape. I have a few rolls of it & until this card, I hadn’t even opened the package. The colors of tapes were pastel & thought they went well w/ the Pastel Paper pack. I covered a piece of card stock w/ strips of the pastel Washi tape on the diagonal then die cut the large egg background. I used more of the tape to cover the largest layer which was die cut w/ the Flourished Star Pattern die. 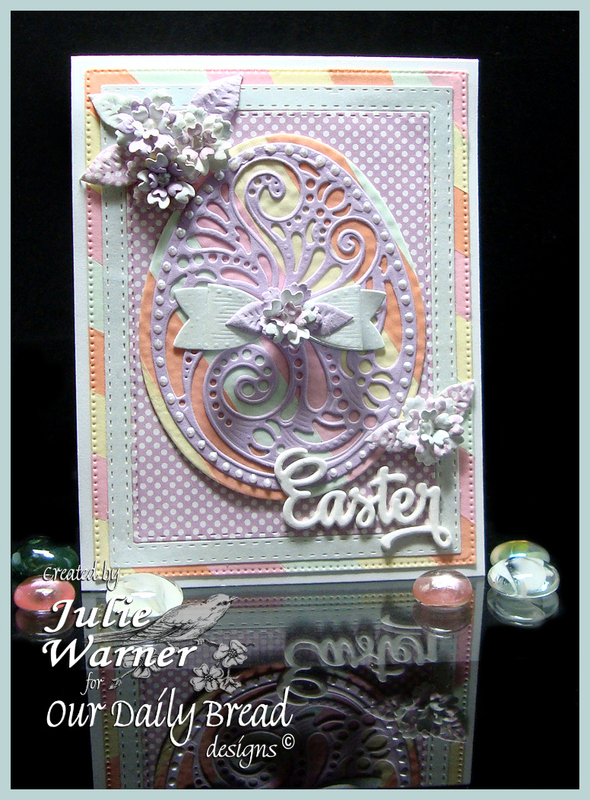 The Boho egg topper was cut out of lilac & the mint frame, polka dot bg , all the little flowers & bow are all from the Pastel paper pack. I added some dots of pearl pen all around the egg & in the centers of the flowers then added the Easter word at the bottom. 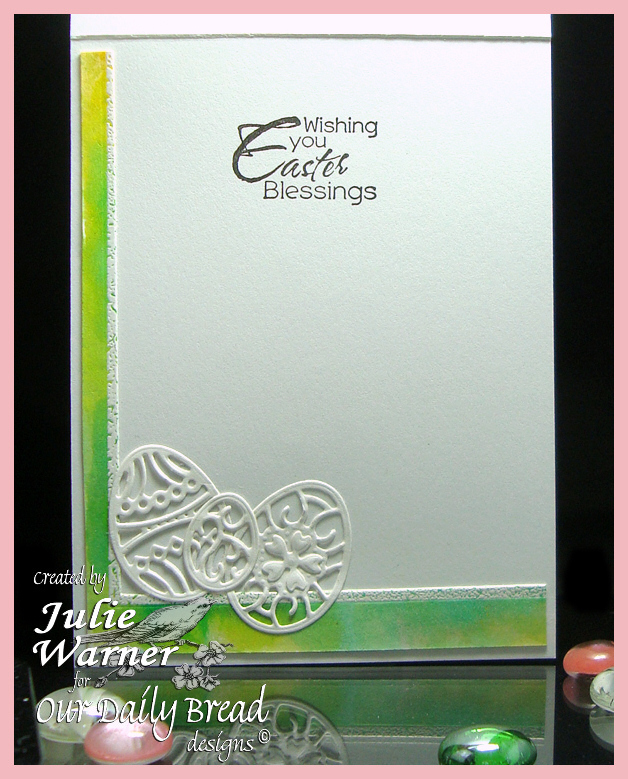 For this card, I stamped the Easter Egg Background w/ white pigment ink onto water color paper then heat embossed it w/ white powder. I used the Distress stains to dab color over the background then a wet paint brush to move the color. 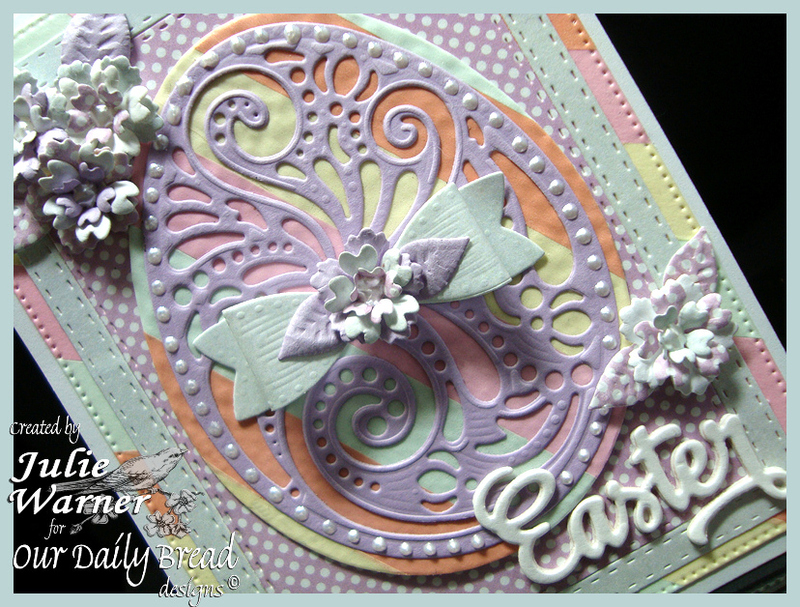 I only used the topper for the Boho Egg in order to let the colors show through & I added a Medium Bow on top & the full Happy Easter die cut greeting below. 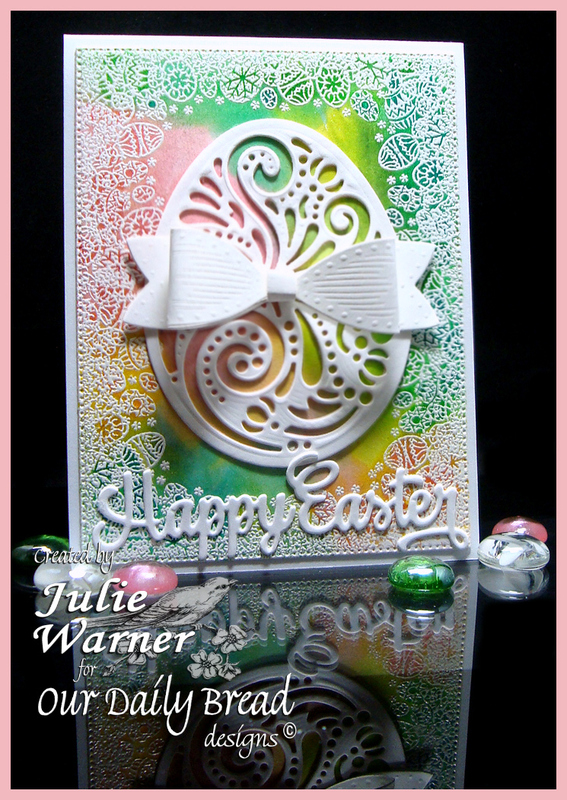 Here’s the inside using a few of the Easter Egg die cuts.